This article is brought to you by DOVU. A token you earn and spend by sharing and changing the way you travel. 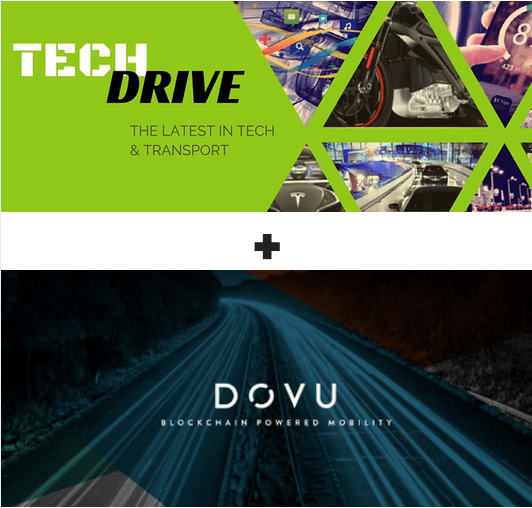 Dovu, the UK blockchain startup that is to become the global ecosystem for transport data, has partnered with Silicon Valley and London based future of travel publication TechDrive. The partnership will see new editorial around blockchain, mobility and the future of travel, covering startups to corporates who are wanting to implement blockchain technology into their products or services. In April 2017, DOVU received seed funding from InMotion Ventures, Jaguar Land Rover’s investment arm, and Creative England, a fund backed by the UK Government and a highly successful token sale on 17 Oct, 2017. Founder and CEO Irfon Watkins is a serial entrepreneur who has founded and sold companies across the API spectrum, including the large-scale ad-platform Coull. His advisory board includes Lars Klawitter, General Manager of Rolls Royce Bespoke, who is also a director of the Ethereum Foundation, no less. DOVU also includes co-founder and CMO Arwen Smit, and co-founder and COO Krasina Mileva. Transport data is currently locked up on multiple platforms. By using blockchain technology, DOVU aims to provide trust between corporates and individuals by aligning actors around value adding activities in the mobility ecosystem. The DOVU system works by applying tokenised incentivisation to data sharing and associated services. That would mean vehicle hire, insurance companies, ride-sharing and others could be connected to create a network of transport-related data resources. This shared data becomes more valuable because it’s shared, not because it’s locked into one platform. Founded in 2016 by Welsh serial entrepreneur Irfon Watkins, Dutch marketing expert Arwen Smit and Bulgarian lawyer Krasina Mileva, DOVU is creating a new circular economy for mobility data using blockchain technology. Founded in 2012 by entrepreneurs Hermione Way and Serhan Perincek, racing car driver Collete Davis and Emmy Award winning journalist Kym McNicholas, TechDrive is a news site at the intersection of travel and transport. TechDrive is an FIA Accredited Media Partner of Formula-e Championship.